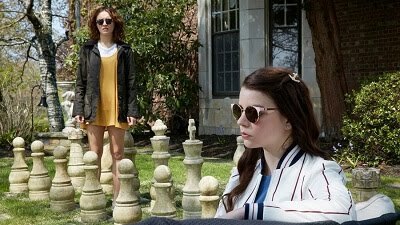 I had the distinct pleasure this year of covering a few of the films that were shown at the New York Film Festival, which took place September 26th-October 12th. When an actor undergoes a radical transformation for a part, that tends to be all that is talked about when people reference the film. In some cases, the film follows suit and presents an astonishing portrait of a complicated and mesmerizing individual, but, more often than not, it’s the performance or even just the act of becoming unrecognizable that earns praise. It’s impossible to argue that Steve Carell isn’t trying something completely new in Bennett Miller’s “Foxcatcher” as he plays an eccentric billionaire with a passion for wrestling, but the film that surrounds him isn’t quite as fascinating as he is. This is the third feature film directed by Miller after “Moneyball” and “Capote.” Both those films featured very individual magnetic real-life protagonists and the intriguing circumstances that surrounded them. This film is no different, though its setting is far from the world of baseball or true crime. Instead, Carell’s John E. du Pont obsesses over the world of wrestling and sets his focus on Olympic medal-winning brothers Dave and Mark Schultz. John zeroes in on Mark (Channing Tatum), the less connected of the two, and approaches him to come live on his vast property and be a part of his championship team, while Dave (Mark Ruffalo), who is married with two children, takes considerably more convincing. Through it all, it is clear that John has extraordinary delusions of grandeur about both his abilities and his connections with people, supported by the appeasement of others who dare not speak against him for fear of retribution from the financial heavyweight. 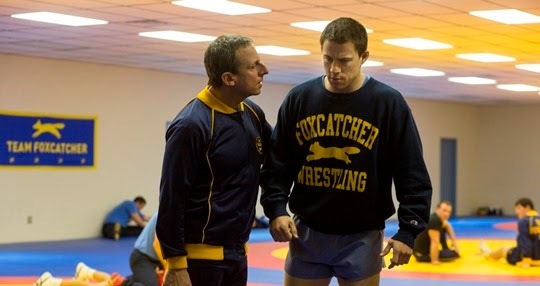 There is a certain discomfort that pervades “Foxcatcher” as Mark spends more time with John and he reveals more of his own self-perceptions, putting on an extreme act when in sight of his disapproving elderly mother (Vanessa Redgrave). Something is obviously off, a sentiment supported by silent gazes from John at Mark when he seems like he might not be performing to expectations or Dave when he threatens to steal the spotlight of the father figure role John believes he has earned. What should be a gradual progression of foreboding is far from subtle, and the film feels unbalanced and eternally both in the middle of its story and ready to be done telling it. This film is ultimately about three people: John, Mark, and Dave. Actresses Redgrave and Sienna Miller have minor parts that hardly required such big names, and the film is carried by the odd trio of Carell, Tatum, and Ruffalo. Carell demonstrates that he is more than capable of trying a new genre and what ranks as a dynamic and interesting performance. Tatum and Ruffalo are both solid fits to play the wrestling brothers, each equally committed to their craft. Their determination and level of engagement represent what the entire film should feel like: a love of the sport and the way in which it envelops their lives. The film has its moments but doesn’t feel nearly as passionate as its characters.